The Queen opened the Annual Meeting of the Women's Institute in its centenary year at Royal Albert Hall, London. 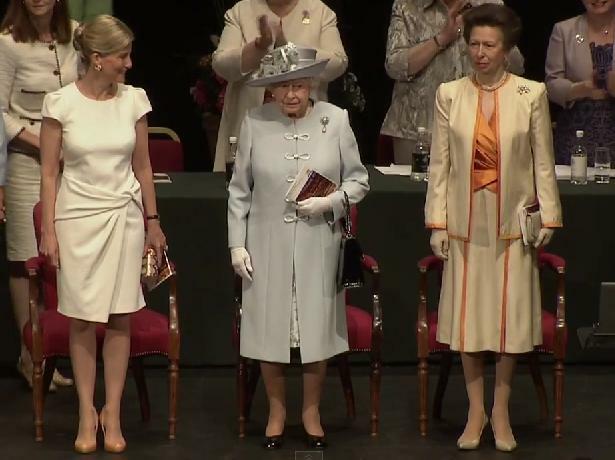 The Princess Royal and The Countess of Wessex were also present. This WI centenary business is producing some good events so far. First, it gives us a garden party attended by the royal version of the Fantastic Four, and now, Her Maj joins in with her daughter and daughter-in-law for a bit of fun. The Queen is President of the Sandringham branch of the Women's Institute, and pays them a visit during her annual holiday break. She has a Women's Institute Badge that she often wears to that meeting, but today she went with the Cambridge Pearl Pendant Brooch. A gorgeous match for her Rachel Trevor-Morgan hat and Stewart Parvin coat, no? I assume that after some years have passed, he will be made a Knight Grand Cross, as happened with his uncles Prince Andrew and Prince Edward. While some have been waiting for Harry to get the Order of the Garter (doubtful until Charles takes the throne, if you ask me), this is the one I've been waiting for him to receive. It's a great way to recognize the good works he's done so far!